by Gregory R. Shafer, Ph.D. This book was created to "prevent books and instruction from overwhelming the writing process." 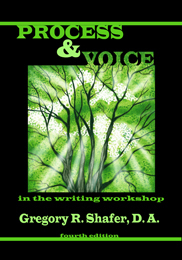 Process and Voice in the Writing Workshop, 4th ed. Is the result of the author’s desire to empower students and to prevent books and instruction from overwhelming the writing process. This book is relatively short, for a text, descriptive, and often defiant when it cones to “traditions” of good English. 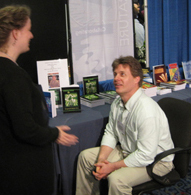 Shafer’s work includes the essays of former students as well as two of his own pieces. He manages to demonstrate how every form of prose cannot always follow prescriptive rules and, still, be quality and exciting to read and write. For the students who may find writing intimidating, Shafer’s book is one that allays those concerns. It helps a beginning writer enjoy the process of developing good prose. Dr. Shafer is a professor at Mott Community College in Flint, Michigan. Dr. Shafer is committed to encourage "writing when it is good and meaningful, is not about instructors but about their students and the rediscovery of writing's liberating potential.